I’d like to thank Stacey for her lovely write up of our interview about my life and writing. I do hope you can take a look and find out a little more about me and my writing. As most of you know I now live back in the UK but the beautiful photo of ‘where I write’ is actually the view I had from my desk at Lakeside where most of ‘The Cavalier Historian’ was written. I was very lucky to have probably the best view in the world from an office! What would you do if someone told you that there was a witch living in your town or village? Most people in the western world of the 21st century would smile and treat it as a joke at best, and at worst as someone trying to stir up trouble. But things would have been very different in the past. During the Middle Ages witches were thought to be behind many illnesses from fevered nightmares to sick animals and dying children. This supposed interference in the natural order of things was known as bewitchment and struck at regular intervals, blighting the lives of thousands of people over hundreds of years. During the period of the 15th to 17th centuries bewitchment reached epidemic proportions with over 40,000 men, women and children in Europe being executed as witches. It was not only the poor who believed in witchcraft, even well-educated people of the time feared the supernatural and the Vatican sent out a decree warning people against bewitchment. England was no different to the rest of Europe and many witch finders made it their life’s work to hunt down witches, one actually took 250 people before the courts in just two short years. Witches were greatly feared, and witchcraft was punishable by death. A well-known example happened at a manor house in the village of Warboys near Cambridge in 1589 when a mysterious illness struck down the five little daughters of the Throckmorton family and seven of their maidservants. The illness bore all the hallmarks of witchcraft, and fear spread throughout the village. The distraught family called in doctors and church leaders to try to diagnose what was wrong (at the time many doctors were willing to accept the idea of witchcraft after all other available explanations for an illness had failed). The sick victims at Warboys had all the classic symptoms of bewitchment – hellish visions, often of wild animals (one said she saw a cat tearing her flesh off); the bodies of those affected went into violent fits and writhed in agony on their beds. Once it was decided that witchcraft was the source of the problem someone had to be blamed and, as with most cases at the time, it was an innocent local misfit, Alice Samuel, who was singled out. Standard practice was to torture a witch, who would often be branded or held under water; witchcraft was so feared that it didn’t matter how much the accused suffered as any method used to see the curse of bewitchment lifted was deemed totally acceptable. Many people believed that if you scratched a witch to draw blood it would help to relieve the suffering of the person who had been bewitched and so this was done to Alice on several occasions. After a year of continuous pressure Alice Samuel finally confessed to being a witch. As punishment, and to keep the village safe in future, she was hanged, along with her husband and daughter. Another well know incident of witchraft happened in Salem on the east coast of America. 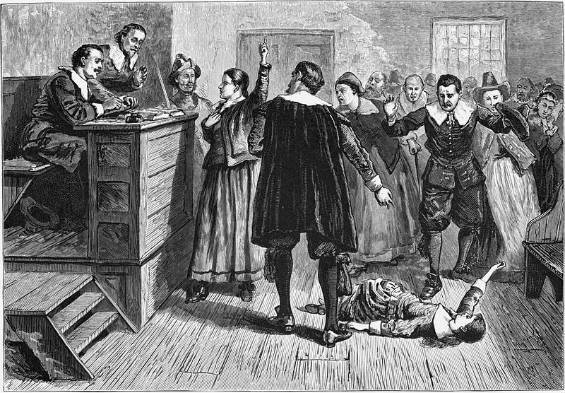 The Salem Witch trials of 1692 played out in a very similar way to the Alice Samuel case, and Arthur Miller later wrote about what happened in his play The Crucible. In December1691 many settlers in Salem had been struck by a horrifying disease, similar in its symptoms to what happened in Warboys and, as in England, it was believed that the Devil was responsible. The town doctor was convinced that what was happening was the result of witchcraft, particularly as eight girls said that they had been bewitched; for the next year the young girls regularly testified in court against other town members. Based on the evidence of the children 152 people were imprisoned on charges of witchcraft, and although none of them confessed 19 men and women were found guilty and executed as witches. So what was going on? Was there simply a widespread primitive belief in the devil and witchcraft, or was there something else behind these incidents? Professor Linnda Caporael is a Behavioural Psychologist who studied what happened at Salem. Many people believe that the girls had made it all up, but Linnda could think of no reason why they would have done that, or kept up the pretence for so long. The more she studied, the more she began to believe that most of what the girls had experienced had not been faked, particularly when they suffered from severe convulsions. Another factor which made her question accepted belief was that the girls were not the only ones to have experienced visions, many other men, women and children in the village reported hallucinations to the doctors and clergymen. When Linnda re-read another account it made her think that the symptoms were very similar to those experienced by people who had taken LSD (acid) which is an hallucinogenic drug from the 1960’s. People who have taken LSD say that they experience hallucinations like living nightmares which are very similar to what the victims of witchcraft said in Salem. This left Linnda with one big question – if the cause of witchcraft was LSD, where had the drug come from? LSD did not exist in the 15th to 17th centuries, in fact it was not until 1943 that the Swiss neuro-physiologist Albert Hoffman experimented with a natural fungus called ergot whilst looking for medical applications for a drug. As part of his experiments he made an extract from the ergot fungus, accidentally spilling some of it onto his hand. Within hours he began to hallucinate. When he finally recovered from the horrific hallucinations he set to work and derived LSD from the extract. Linnda Caporael began to look at ergot poisoning as a possible explanation for bewitchings. The descriptions of the effects of the drug on people which she found in medical books matched the symptoms from Salem and she was convinced that she had found an explanation for witchcraft in nature. The next question, then, was how the settlers had come into contact with the drug? As it was not only the settlers in Salem who were affected by witchcraft but their animals as well (cattle acted strangely and died of no natural causes) Linnda began to wonder if a food common to both humans and animals could be the source, so she began looking at grain. The dominant crop in Salem was rye, so the question now was to find out how ergot could have got into the rye fields. To help her Linda looked at the work of fungal toxicologist, Professor Maurice Moss. A fungus contaminates its host and gradually replaces the original seed with its own material so, Linnda surmised, if the rye in the fields was contaminated with ergot then the bread would have been contaminated too. This was important to her theory because the nerve toxins now contained in the bread would account for the hallucinations, pin pricking sensations, the feeling of insects crawling beneath the skin and the powerful fits which meant that the sick people could barely be held down by their friends and family. Ergotamine (taken from the word ergot) is a drug used in Holland to treat migraines and has been shown to have constrictive powers which can lead to convulsions, and to the blood draining from the skin causing pricking sensations. Linnda then turned to look at the environment which, again, supported her theory. Ergot thrives in wet, damp soil, and in 1691 the Salem crops had been planted in low marshy ground. For a mass infection of the harvest to take place it would have needed a warm wet spring and summer; the spring of 1691was stormy and wet and was followed by a wet summer, the crop grown in Salem was rye. Most of the sickness was on one side of the village where the homes backed onto the western farms with swampy marshlands. Rye was also the staple diet in Europe in the Middle Ages which, if Linnda Carpoael is correct, could explain the witch persecutions which took place so frequently; particularly as the poor peasant classes were hit most, and rye was their staple diet. An historian by the name of Professor Mary Matossian has mapped outbreaks of witch trials which were localised in Britain – these were mainly, but not exclusively, in Essex and East Anglia – the surprising result is that the outbreaks coincided with the main rye growing regions. As the weather conditions at the time were different to today, with wetter and warmer summers, the conditions were ideal for the formation of ergot on rye. Supporting scientific evidence for this theory about the causes of witchcraft comes from the ‘peat bog man of Grauballe’. He was buried in a bog in Denmark during the Iron Age and found in 1952. The man had been murdered with a knife and club then dumped naked into the bog – his throat had been cut from ear to ear and a blow to the right temple had fractured his skull. Although this sounds brutal this ritual was often carried out if someone was thought to be possessed by demons, the fracturing of the skull would allow the demon to escape and the victim could rest in peace. A post mortem was carried out on the Grauballe man in 1952 and his stomach contents showed that his last meal had largely comprised of ergot. Chemical tests on a gut sample showed that ergot alkaloids were present, therefore the man would have been hallucination, convulsing, vomiting etc. and would probably have been killed as a witch. The most recent case of a mass poisoning happened in 1951 when an entire village in France had ergot poisoning caused by infected bread. In Pont St Esprit (Provence) in August of that year 250 people were struck down, several were taken to hospitals and psychiatric asylums in the weeks which followed. They were sick, had stomach cramps, couldn’t sleep, suffered from violent convulsions and terrifying hallucinations. Many had to be strapped down to stop them jumping out of windows to escape their torment. At least five people died during the outbreak and when ergot poisoning was finally found to be the cause many people did not believe the explanation. The Bishop of Nimes was called in to exorcise the devil from the bakery which had been the source of the outbreak. Interestingly, a dog which had been fed on scraps of the rye bread ran in circles and was biting at rocks until it broke its teeth on them and then died. This was an exact parallel to what happened to the animals in Salem. So, was witchcraft really a problem in the past, or were bewitchments caused by ergot poisoning? I am fascinated by the fact that scientific research is constantly revealing more about our past. I have come to believe that the misinterpretation of ergot poisoning is responsible for reports of witchcraft over the centuries, and this is what lead me to write the conclusion to the story of Rebekah and Simon in my novel ‘The Cavalier Historian’. Today is the 75th anniversary of one of the worst defeats in British military history, the fall of Singapore during the Second World War. Japan in the 1930’s was a country looking to expand its influence in the Far East, and the Allies tried to halt Japanese campaigns in China by imposing sanctions. These actions were effective and oil reserves in the island Empire were soon rapidly depleting. With the situation becoming ever more serious the Japanese felt that they had to do something to secure their vital resources so plans were put in place to attack Great Britain and the United States. These attacks would open up the way for an invasion of the Dutch East Indies which were rich in oil. At the southern end of the Malay Peninsula is the island of Singapore. Nicknamed the ‘Gibraltar of the Far East’ it was the key to British defence strategy in the Far East and it was believed that the island was impregnable. Britain’s possessions in Asia would have been vulnerable without a strategic military base to protect them, and this role fell to Singapore where the expensive defences were completed in 1938. Japan was seen as the only country which could possibly be a threat in the area, but the British believed that the Japanese army was inferior to their own and only capable of defeating the backward Chinese. Japan did not believe that they were any way inferior to the West just because their culture was different. They refused to accept interference in their designs on China and so made almost simultaneous Japanese attacks on Pearl Harbor and in north Malaya and Thailand which led to Britain declaring war on the Empire on 8th December 1941. 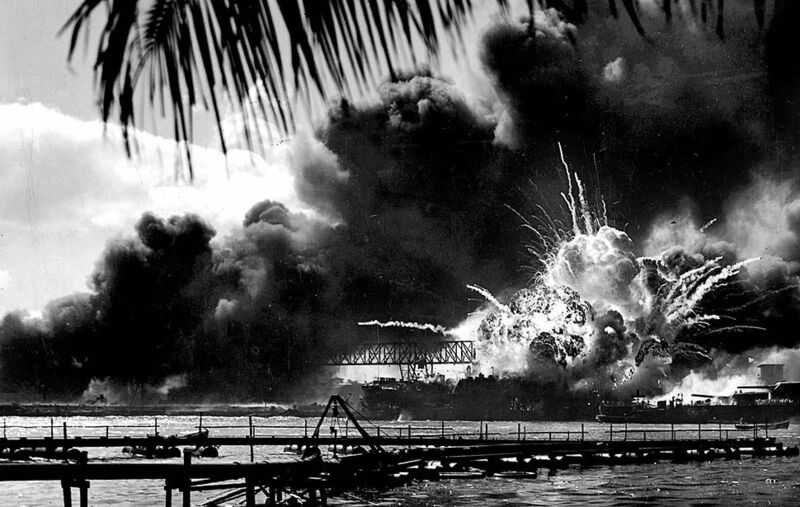 PEARL HARBOR,HAWAII: The USS Shaw exploded after being struck during the attack on Pearl Harbor December 7, 1941. The defences at Singapore were manned and the forces ready to repel an attack by sea so the British were taken completely by surprise when the Japanese attacked overland. The Allies believed that the Malayan jungles were impassable to a military force, but the Japanese were aware of this and so made their way through the jungles and mangrove swamps of the peninsula, taking no prisoners to slow their advance. Japanese aircraft attacked the airfields in Singapore, destroying almost all of the RAF’s frontline planes and leaving the island with no air defences. In an attempt to halt the Japanese, the battleship ‘Prince of Wales’ and the cruiser ‘Repulse’ put to sea from Singapore on the 8th December and headed north to the enemy landing sites. On the 10th both ships were sunk by Japanese torpedo bombers, delivering a crushing blow to British forces, and British morale back home. The east coast of Malaya was left exposed and the Japanese were able to continue their landings unopposed. Only the army could stop the invasion now. Lieutenant General Percival led the Allied forces of 90,000 men, the majority of whom had never seen combat. The Japanese forces, on the other hand, were led by General Yamashita; most of the 65,000 men he commanded were much more experienced than the Allies, having fought in Manchuria against the Chinese. Moving swiftly on foot and stolen bicycles the Japanese were ferocious, killing captured and wounded soldiers, torturing and killing Malays who had helped the Allies. The British forces were shocked by the brutality of the enemy and, after the fall of Jitra on 12th December 1941, retreated towards Singapore. Kuala Lumpur, the capital of Malaya, was captured by the enemy on 11th January 1942; the Allies continued to fight fiercely even though things were looking increasingly bleak for them. One example of the determination of the defenders happened at Bakri where Lieutenant Colonel Anderson fought the Japanese for five days (18th – 22nd January). It was only when his men ran out of ammunition that he was forced to retreat, leaving behind about 150 wounded Australian and Indian soldiers. These men were later all killed by the Japanese. Anderson was awarded the Victoria Cross for his leadership in the fighting and withdrawal. The retreat forced the Allies into an ever smaller area of the peninsular until the British and Australian troops finally crossed the causeway which separated Singapore from Malaya and prepared to make their last stand on the island, destroying the causeway behind them. Churchill ordered that a strong defence should be put up and surrender was not to be considered until there had been ‘protracted fighting’ to try to save the city. The British believed that the Japanese would attack Singapore across the Johor Strait; unsure of just where the attack might come Percival decided to position his men so that they could defend the entire coastline, stretching to some 70 miles. He had overestimated the strength of the enemy and this spread his resources too thinly so that they could not adequately defend any one section of the line. When the attack came on the 8th February 1942 many of the defenders were too far away to influence the battle, and Percival was reluctant to move them closer in case the Japanese attacked on a second front. 23,000 Japanese attacked with surprising speed and ferocity, while the British continued to doggedly defend Singapore. On the evening of 10th February Churchill sent a cable to Wavell, saying: ‘I think you ought to realise the way we view the situation in Singapore. It was reported to Cabinet by the C.I.G.S. [Chief of the Imperial General Staff, General Alan Brooke] that Percival has over 100,000 men, of whom 33,000 are British and 17,000 Australian. It is doubtful whether the Japanese have as many in the whole Malay Peninsula … In these circumstances the defenders must greatly outnumber Japanese forces who have crossed the straits, and in a well-contested battle they should destroy them. There must at this stage be no thought of saving the troops or sparing the population. The battle must be fought to the bitter end at all costs. The 18th Division has a chance to make its name in history. Commanders and senior officers should die with their troops. The honour of the British Empire and of the British Army is at stake. I rely on you to show no mercy to weakness in any form.’ This was a forceful, no holds barred message which could not be ignored; even though the Allies had lost their food and fuel supplies to the enemy Wavell told Percival that the ground forces were to fight on to the bitter end, and that there should be no general surrender in Singapore. On 14th February the Japanese broke through part of the Allied defences and advanced towards the Alexandra Barracks Hospital. The staff there could see no hope of rescue and so decided to surrender, sending a British lieutenant with a white flag to talk to the Japanese; he was bayonetted to death. The Japanese troops then entered the hospital and immediately killed around 50 patients, some of whom were lying on the operating table; doctors and nurses were also murdered. The following day about 200 male staff members and patients (many of them walking wounded), were taken to a nearby industrial area where they were murdered. A small number of the men survived by playing dead and were able to report this atrocity at the end of the war. By the morning of the 15th the Allies were almost out of food and ammunition. There was a heated conference of the senior commanders who reluctantly agreed that there was no hope of victory and the garrison should capitulate. Percival formally surrendered at 17.15. This was the largest surrender of forces led by the British in history. 100,000 Allied men (British, Australian, and Indian) were taken prisoner when Singapore fell. A number of the prisoners were held in Changi Prison where many of them died, but the vast majority were shipped out to work as forced labour for the Japanese, some in Japan itself, some on the Sandakan airfield, and thousands on the infamous Burma railway (around 9,000, or 9% of those taken prisoner, died on the railway). It was not only the Allies who suffered at the hands of the Japanese. A large percentage of the population of Singapore was of Chinese descent and many of these people were massacred by the victorious invaders. No one knows how many civilians were killed, the Chinese of Singapore said it was 50,000 although the Japanese said it was closer to 5,000 (historians believe this estimate to be too low, based on the actions of the Japanese in places like Nanking, and the true figure will never be known). The shocking surrender of the British forces in Singapore showed the world that, despite expectations, the Japanese army would be a major player during the war. The conflict in the Far East continued after the war in Europe had been won and was only to end with the devastating attacks on Hiroshima and Nagasaki. British forces had planned to liberate Singapore in 1945 but the war ended before they could carry out their attack. The Japanese surrendered unconditionally in September 1945 and British, Indian, and Australian forces moved back into Malaya and Singapore. The Japanese commander, General Yamashita was tried by a US military commission for war crimes; he was convicted and hanged in the Philippines on 23 February 1946. There are few survivors of the fall of Singapore still alive today, 75 years later, but that doesn’t mean we should forget. Perhaps we can take a few moments today to remember all those who died or suffered life changing experiences either during the battle or in the three years of Japanese ruled which followed. Penang, 1939. Sixteen-year-old Philip Hutton is a loner. Half English, half Chinese and feeling neither, he discovers a sense of belonging in an unexpected friendship with Hayato Endo, a Japanese diplomat. Philip shows his new friend around his adored island of Penang, and in return Endo trains him in the art and discipline of aikido. But such knowledge comes at a terrible price. The enigmatic Endo is bound by disciplines of his own and when the Japanese invade Malaya, threatening to destroy Philip s family and everything he loves, he realises that his trusted sensei to whom he owes absolute loyalty has been harbouring a devastating secret. Philip must risk everything in an attempt to save those he has placed in mortal danger and discover who and what he really is. With masterful and gorgeous narrative, replete with exotic and captivating images, sounds and aromas of rain swept beaches, magical mountain temples, pungent spice warehouses, opulent colonial ballrooms and fetid and forbidding rainforests Tan Twan Eng weaves a haunting and unforgettable story of betrayal, barbaric cruelty, steadfast courage and enduring love. In ‘the Gift Of Rain’ the reader is immersed in life in Malaya during the 1940’s. Tan Twan Eng writes some of the best prose I have read in a long time, and it pays to take the time to read slowly and savour this poetic and evocative language. Whether he is describing the beauty of Malaya or the brutality of occupation the author places the reader there, in the midst of the action, in such a way that it easy to become lost in this book. Supporting the lyrical descriptions is a cast of characters who are multi-faceted and totally believable. It is easy to sympathise with Philip in his search to find out where he belongs; even when he makes choices which we might not agree with we can understand his reasons and fervently hope that he will find the love, acceptance and peace that he is searching for. This book is written in two distinct sections. The first, set in Penang in 1939, moves at a gentle pace as Philip meets a Japanese aikijitsu master, and through his lessons with Endo develops a physical, intellectual and spiritual awareness which remains with him for the rest of his life. There is a strange bond between the two which seems to transcend time and space, and the playing out of this relationship is the pivot of the whole book. The second part of the book takes place after the Japanese invasion and is faster paced, dramatic and hard hitting. Philip finds that life puts him in a position which challenges his ethics and morals; does his loyalty lie with his family or with Hayato Endo? Or does he have a much broarder loyalty to the people of Malaya? And where does his sense of self fit within this conflict? ‘The Gift Of Rain’ evokes a real sense of time and place, giving the reader insights not only into the history of Malaya but also of Japan and China. The way that the Second World War impacted on the different ethnic groups and their relationships with each other is the cloth of which this story is woven; it is a testament to the thorough research which Tan Twan Eng has made of the history of these countries, and of the colonial impact which played a part in shaping events. Why does history seem to see British occupation of Malaya as acceptable, unlike the Japanese occupation which is seen as criminal? What responsibility did the colonial power have to the people of Malaya, and they to it? There are no easy answers to this, and the questions raised are played out through Philip’s own personal search for identity. Tan Twan Eng has created a book which looks at the darker side of life yet which holds an incredible balance. One could almost describe the whole novel as an evocation of the ying and yang of life, the balance of duty and loyalty, the image of a civilised and refined Japan which can be selfish and brutal at the same time. It is a book which is incredibly difficult to categorise. Part historical fiction and part martial arts treatise, part philosophy and part a coming of age story, it is a book which draws the reader in from the very first words and doesn’t let go, even after the last page has been turned. I have read this book a number of times and come back to it again and again, learning something new each time. I heartily recommend ‘The Gift Of Rain’ as one of those few books which will leave a lasting impression on you for some time to come.